The actions of the left are growing more vile, vicious and violent as we approach the 2018 mid-term elections. This is the way they act when they cannot win elections or the debate of ideas and resort to bullying tactics instead. I haven’t heard one Democrat suggest they dial it back. The opposite is true, many Democrats have suggested it should continue. These are classic totalitarian (facsist, Nazi, Communist, etc) tactics. There are those of us who expect this to boil over if the Democrats lose the mid-terms. Here is a short and developing list of their uncivil actions to date. 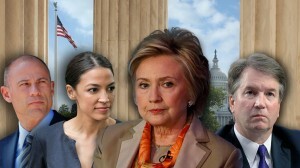 Bill Cassidy, senator from Louisiana, responded to Hillary: “At a time when Republicans are being shot, stabbed, doxxed, beaten, mailed powder, run out of restaurants, and sent death threats, Hillary Clinton urges Democrats to be even more uncivil. What an irresponsible statement. Every Democrat should denounce.” They’re not gonna denounce her. They privately, publicly encourage her. They applaud it. They support it. That is who they are.